Individualized calorie needs for men are highly variable – and based on each man's current body weight, activity level and weight-management goals. According to the Weight-Control Information Network, 74 percent of U.S. men are classified as overweight or obese. Many of these men may benefit from adopting reduced-calorie meal plans. Men who work out regularly generally require more calories daily for weight maintenance than inactive men. According to the University of Washington, while moderately active men need about 15 calories for each pound of their body weight per day, men who regularly perform strenuous-intensity exercise need closer to 18 calories per pound of body weight daily. The University of Missouri Extension notes that male athletes may require more than 22.7 calories per pound of their body weight each day. The University of Washington suggests men with low activity levels consume about 13 calories for each pound of their body weight daily. 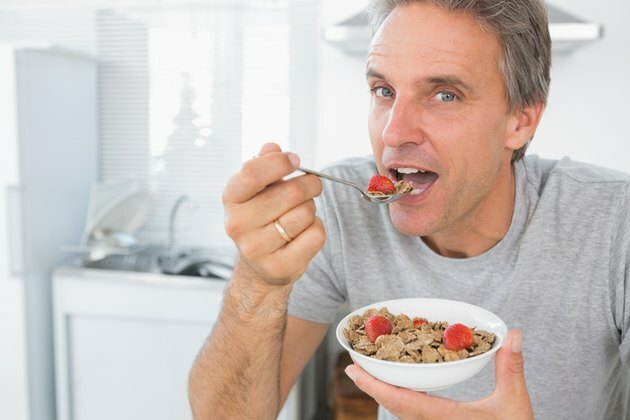 This means a 165-pound inactive man needs about 2,145 calories a day, while an inactive 175-pound male requires about 2,275 calories daily to maintain his current body weight. The Dietary Guidelines for Americans 2010 suggests inactive men often need 2,000 to 2,600 calories a day for healthy weight maintenance. Obese men should aim to consume 10 calories for each pound of their desirable body weight daily, according to the University of Washington. Therefore, a 250-pound man should aim for 1,700 calories daily if his goal weight is 170 pounds and 1,600 calories a day if his desirable weight is 160 pounds. Following this recommendation should help overweight and obese men slowly move toward a healthier body weight. The National Heart, Lung and Blood Institute suggests most men eat about 1,200 to 1,600 calories daily during weight loss. Because calorie requirements are sometimes more complex than just multiplying a man's body weight by an activity factor, using an online calorie-needs calculator can help estimate a man's individualized needs based on his height, age, current weight and activity level. An example of such a resource is the U.S. Department of Agriculture's Daily Food Plan. Based on results of this online tool, a 45-year-old, 5-foot-10-inch, 165-pound man who exercises 30 to 60 minutes a day requires about 2,600 calories daily to maintain his current weight. How Many Calories Should a Man Eat While Trying to Lose Weight?